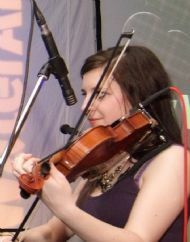 Elspeth MacDonald is a consumate musician and our Fiddler. She was formally trained at Douglas Academy where she studied for six years with Andrea Gajic. She has however always maintained her traditional heart playing with Cowal Fiddle Workshop and Canned Haggis. Her reels are blistering, her waltzes and airs are heartbreaking. She is a beautiful player with a big personality. Carole Marshall has been playing traditional music all her life. She first performed as a fiddle player with the Cowal Fiddle workshop, an organisation that she lead for a number of years before joining Canned Haggis. 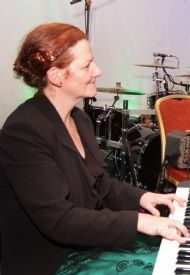 As well as providing thumping bass lines and sympathetic accompaniments she is a beautiful singer with a large repertoire of traditional songs. 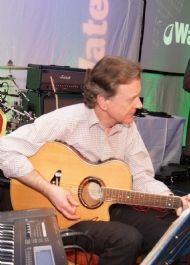 Derek McDermott is also a founder member of Chanty Dyke Ceilidh Band. With his driving guitar rhythms he is the powerhouse of the band . His djembe percussion playing occasionally features in the dances, but mainly in the band's songs. A fine singer, he often provides the last waltz. A man of many parts , with most of them still working! Alistair Davidson began his career in music playing piano with his father and accordianist Alex Davidson. He now plays Fiddle and Mandolin with Canned Haggis and is also a dance caller with endless patience to help those less familiar with the Ceilidh dancing. As well as all the usual favourites Canned Haggis have a few unique dances of their own. They are all brilliant fun and they are all easy!